We also refer this vCard thing to VCF file format. Theoretically and practically, one VCF file is able to hold multiple contacts. However, a downfall that Outlook has is you can only export one contact per VCF file at a time. Up to some point, it is not practical when trying to import a large number of contacts at once. If you try to select all your contacts and save them, you would end up with one single TXT file instead. This TXT file cannot be used for import and it is probably good for printout. Click on People at lower-left. Click on selected contact in the selected contact folder. Browse to location where you will be saving the vCard file and click on Save button. 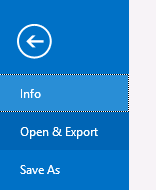 Select the contact folder you want to export under Navigation Pane of My Contacts. Use hotkey of CTRL + A to select all contacts and CTRL + C to copy all of them. Fill in e-mail address you want to send your contact backup to. Use hotkey of CTRL + P to paste all the contacts you just copied to clipboard. Click on Send button to send contacts to your e-mail address. 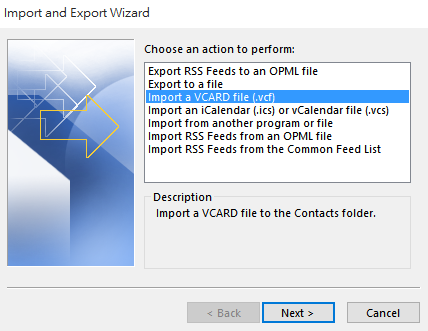 Select Import a VCARD file (.vcf) and hit Next >. 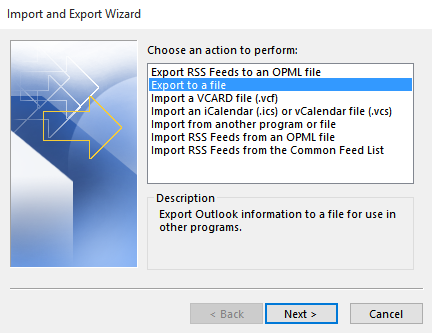 The above method will import vCard file to your Outlook default folder. 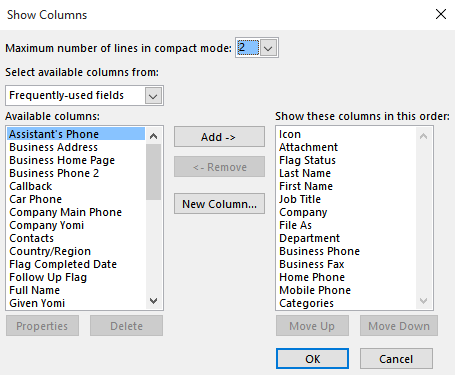 Therefore, it may not fit your need if you want the contact entry to be imported at your specified location other than Outlook default folder. Yet, it is not efficient because it only imports one contact entry at a time. Browse to the folder where your vCard files are located. 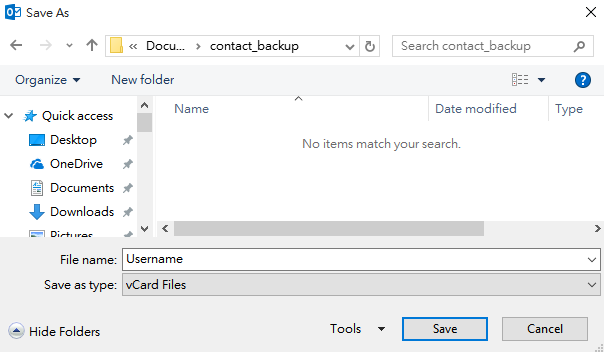 Use CTRL + A to select all vCard files if only vCard files exist in the folder. Or, Use CTRL + Mouse Click to select vCard files. 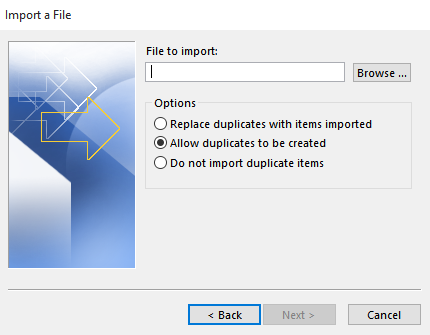 Use CTRL + C to copy all selected vCard files onto clipboard. 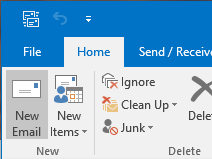 Go back to Outlook and click on People at lower-left. Select the contact folder where you want to import contact entries under Navigation Pane of My Contacts. Use CTRL + V to paste all vCard files from clipboard. At this point, you will see many contact entries opened up all in a sudden. Then, what you need to do is to click on Save & Close button at top-left of each contact entry. CSV (Common Separated Values) file is commonly used to store data for import and export in various software applications. 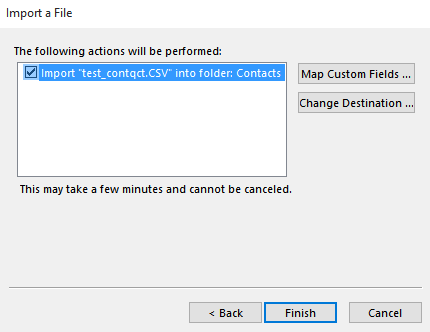 Outlook uses CSV to store its contact information since common (,) can be conveniently used to separate all fields. 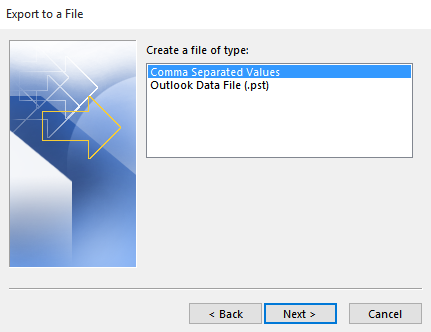 However, exporting Outlook contacts into a CSV file has a potential character encoding issue that characters other than ASCII and the language version your Outlook was installed contained in the contacts will be corrupted. 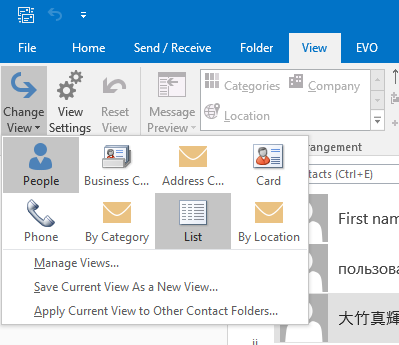 For example, if you install the Korean version of Outlook and your contacts contain any Japanese hiragana or katakana,which are not in UTF-8 or Unicode, then these Japanese characters will appear as junky characters or question marks in the exported vCard files even though they look OK in Outlook before exporting. Select contact folder you want to export and click on Next >. Enter file name for it and click on OK. 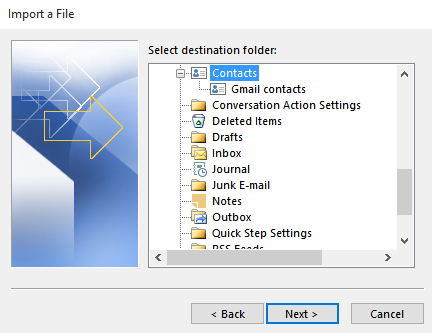 Select a contact folder as your destination in the folder tree and hit Next >. 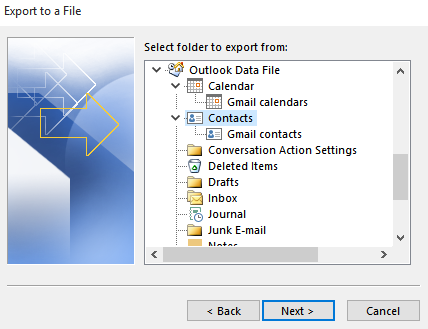 Outlook 2013/2016 contacts are usually displayed in People, Business Card or Card view. 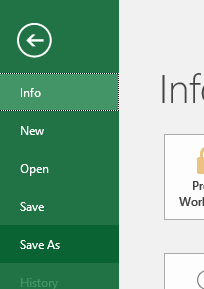 If we like to simply copy & paste Outlook contacts to Excel spreadsheet, then we need to change view to List view. By looking at the List view, some of the fields we use within contact’s profile may not be seen. Therefore, we need to make them visible before exporting. How? We add items via Add Columns. Copy & pasted contact entries with foreign language characters are looking OK within Excel because Excel supports multi-languages. Click on List and contacts will appear in a listing fashion. If additional fields need to be included, click on Add Columns. Select field such as Country/Region to the left and click on Add -> button. Then, Country/Region will appear in the list to the right. If you need to re-arrange order of fields, then select fields and click on Move Up or Move Down to change position. When you finish, click OK to leave the Window. Use hot key of CTRL + A to select all contact entries and use CTRL + C to copy them onto clipboard. 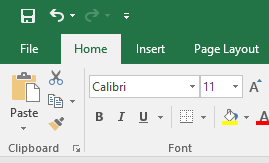 In Excel application, click on FILE at top-left. Being influenced by character encoding issue on CSV files, the imported entries also displays junky characters or question marks on characters other than ASCII and the language version your Outlook was installed. 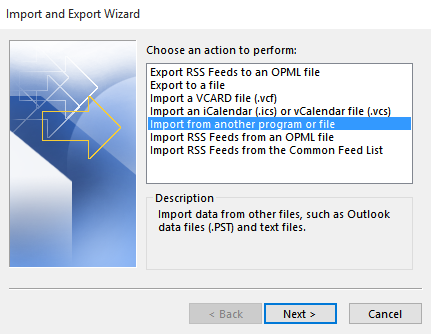 Previous postHow to export Outlook calendar to Excel, iCal and CSV iCalendar (ics), vCalendar (vcs), CSV and Excel? Next postHow to share Google Calendar?